November 20 News | Jobs in Film, Radio, Audio. Radio Connection student Dana Green goes ON AIR! Radio Connection student Dana Green (Las Vegas, NV) easily recalls the first time she was inspired to pursue a radio career—in the third grade. “It was my birthday,” she says. “Every morning I would drive with my family—I’m the oldest of five kids—and my mom would drive us to my grandma’s house, where I would catch the bus to go to elementary school…Every morning we would listen to the morning show, KIIS-FM. It was their morning show. They were the funniest and their show was the most entertaining. I enjoyed listening to their radio show more than I enjoyed watching cartoons after school…On the birthday morning I was going to my grandma’s house, my mom drops me off and she says, ‘Make sure that you listen to the radio show this morning.’ I’m like, “Yeah, absolutely.’…They started doing the birthday shout outs, and they’re saying, ‘Happy birthday, Rachel and Matthew. Happy birthday to Stephanie. Happy birthday, Dana. How are you doing?’ And I just remember thinking to myself, I’m the first person that they said, ‘How are you doing?’ to. Everybody else just got a happy birthday. They’re like, “Hey, Dana. How are you doing?”…I was on cloud nine. And it was at that moment I realized that there was somebody in the radio who was actually doing that, and I thought to myself, ‘I think I could do that.’ Of course, the path to getting to our dreams sometimes has a few detours. Years later, as a young 20-something, Dana says she was caught up in the stress of trying to make money as a bartender in Las Vegas and caring for a daughter. She’d heard of the Radio Connection by then, but never took the first step. Even so, she never forgot her dream. “People that would come into my life, they’d ask me what are my ambitions,” she says. “I’d always say, ‘I would love to be a talk radio show host.’ And I’d always been given the feedback, ‘It’s about who you know,’ and that made sense to me. After working five years in the Vegas service industry, Dana says her breaking point came earlier this year. “It was Cinco de Mayo,” she recalls. “I was working in my minimum wage job here on the Las Vegas strip. I’m a bartender, and I had an absolute meltdown with my manager. It was the worst-case scenario, and I thought to myself, ‘I cannot continue. I’m ready, I’m ready.’ And the next day I called Radio Connection.” Dana was placed as an apprentice at KSHP AM 1400 in Las Vegas. She says not only did she feel welcomed, but from the very beginning sessions with her mentor, Danny Jackson, Dana was thrown into the hands-on workflow of the station. In no time, she was an integral part of the schedule. “Right from the beginning, I think my first day at the radio station, Danny and I were producing commercials together,” she says. “I voiced a Dodger baseball bumper. It was a 30-second spot, and that was put into traffic, emailed out and put into traffic. Ever since then, I go in every Thursday. I’m there at 7:45 in the morning. I work on the radio shopping show.” Since starting the program, Dana has continued to get more responsibility. Now, she gets regular air time on the microphone. “At the beginning, they were letting me sit in, take notes, listen and watch how they work the phone lines…just kind of observing,” she says. “Then when they threw me into it, I got to be involved with the actual process of the show running on air. At first I was just on the mic, and Danny and I were kind of co-hosting back and forth, talking with one another. And then they put me on the soundboard, so I’m able to talk on the mic and work the soundboard and the phone lines…Now, when I come in at 7:45 in the morning, I get a quick briefing from the sales director. She gives me the sale items for the day, and then I go on air with her. She’s on there for the first 15 minutes until, you know, our first commercial break, and then she basically takes off, and I’m in the radio studio running the show solo…from 8:00 a.m. to 10:00 a.m. every Thursday morning.” It doesn’t end there. Dana has taken the opportunity to throw herself into every aspect of the station, making herself an asset every chance she gets. “They have gotten to the point where, at the end of the show, I’ll ask either Danny or Rene, who is the sales director, I’ll ask them if they need any production work done, and they’ll give me maybe the name of a show, the name of a restaurant, or any of the, maybe an auto parts store. It just depends on what needs to be done. And then I will go into the studio, do my research on them…write up a quick script, then I’ll either voice it myself or will have somebody else in the station voice it for me. After that, I edit it all down and send it out to the sales director, who sends it into traffic…If the show ends at 10:00, I usually leave at about 1:00 in the afternoon…they have given me so much freedom in that studio, it’s unbelievable.” Now, after some detours, Dana is finally on the road to the career she’s always dreamed of having—thanks in part to that fateful moment of crisis in May. “It showed me that I was beyond ready to start the next chapter in my life, because I was done working a minimum wage job that wasn’t fulfilling for me at all,” she says. “It pays the bills, but there’s more to life than just making do…The year of 2016 I was working two jobs. I worked seven days a week between two different restaurants, and thought to myself, ‘This must be the way that you get ahead.’ And by the end of the year, I was in the worst mental state, I was just not happy with what I was doing, I hardly saw my daughter. It was, most importantly, unfulfilling. There was nothing that I was getting out of it, and by the end of the year, I still had nothing to show for it. And here we are in 2017; I have a savings that I’ve never had before, I feel like I’m doing something, because I am going to school. I think over the last five years, I’ve learned the value of life, over anything. And that’s what put me in the right position to finally pursue Radio Connection.” Now that she’s changed course, there’s no looking back. “If I could find myself a job, whether it’s running and getting coffee, I don’t care if I’m sweeping the hallways, if I can get a job somewhere in a radio station right out of school, that’s my goal,” she says. RRFC INTERVIEW: Recording Connection mentor Jake Johnson on making yourself valuable to the studio! Not only is Recording Connection mentor Jake Johnson an industry veteran and a master of his craft, he’s been mentoring students with us for more than a decade! Operating out of the studio he co-founded—Paradyme Productions in Madison, WI—Jake places a high value on learning on-the-job. Also, as you’ll see in the interview below, he sees his students as potential employees, and one of his earliest students still works for him! Below, Jake talks about how he got started, weighs in on issues like opportunities for women in audio, and offers key career advice for students on how to be an asset to the studio. Enjoy! RRFC: Can you give us a brief look at your background? How did you get into audio and music as a career? Jake Johnson: So I was in bands and I was doing a lot of the techie stuff for the bands I was in, and this was back in middle school and high school, and basically setting up mixing boards and doing live sound, and sort of that thing… I’d recorded at a few different studios with my band, and one of the studios we were at, the guy basically didn’t have as good an ear as myself and a buddy of mine who were in the band…He said, ‘You know what, I’m really good at recording drums and guitars. Would you guys come in and help me out at my studio working with these vocalists in these different bands?’ This was the early 90’s, and at that time this was the Madison music scene, very, very cool and kind of up-and-coming. The next thing I know, I was in college and I was working as much as I possibly could in the studio just recording vocalists, because I guess I was just a natural producer in terms of my ear and hearing harmonies and giving advice on singing, just having been a singer for years. So I was in college for genetics. I was going to a four year school for a genetics degree, and successful at it, but also doing this all my time, and then I had to turn down sessions…I was going to be, you know, a genetics researcher, and then all of a sudden it dawned on me…‘Wait, why am I trying so hard to do this genetics thing when [music] is really what I’m awesome at and I really love it?’…So then I switched over and I got a business degree, and I ramped up my hours and worked 60 hour weeks during the summers and 20 hour weeks during school, engineering, producing, working on tons of albums, and kind of the way the local scene was, everyone talks to each other, and I was in a band and talking to people from Chicago and from Milwaukee and all that, and I was super busy from the get-go. RRFC: So how long have you been teaching with us now? Jake: Over 10 years, about 11 years. RRFC: Wow. And what made you decide to be a mentor? Jake: I enjoy teaching, I enjoy the personal interaction and working with younger people, but honestly, I can say from the beginning, to train an employee, especially a young employee, takes a lot of my time. And I’ve gone through that process several times…but then I can’t quite give them something to work on, like an actual paid project, because, you know, I can’t hand off my stuff to someone less competent. That’s always been a struggle, and so I would really invest a lot of time in a young person and then I’d find out, ‘Well, they can’t quite cut it.’ The Recording Connection was a great way to bring in someone, provide training, provide input. So from my perspective, I’m feeling them out as a potential employee the whole time we’re doing this as a program, and giving them some little odds and ends and seeing how they do with it. And I mean, I love the one-on-one concept. I think, as far as teaching goes, one-on-one is where most people learn the most, because then you can cater that to them, and that was the other side of it that I like…Reading a book and going through an academic program doesn’t always give you the on-the-job stuff you need, like how do you communicate with a client, how do you communicate with an artist, how do you resolve conflicts? Those are the kinds of things that you don’t see in a book, but that once you’re part of a program and you see that process happening…I mean, that to me, that’s how you should learn, on the job. RRFC: Let’s imagine that I’m a 20-something year old, a very motivated apprentice in your studio. How I can do a better job of sort of staying in there, calming down, and making good choices when I interface with other people as an engineer? What would you tell me? Jake: There’s one thing that I’ve done my entire career, and I find clients love it: I don’t answer the phone during my sessions. The phone will sit there and ring, and I shut off the ringer and I don’t do it. That’s their time, they’re here for their time. I can check voicemails later… This is just kind of a personal philosophy…but showing vulnerabilities is a sign of maturity. It’s not, you know, if I don’t know something and you don’t understand something going in, be the first one to tell a client, ‘Well, tell me more about that,’ asking questions and kind of approaching life like a constant learning [process], you’re learning every day. Even though I’ve been doing this for over 20 years, I will learn new things all the time…Just don’t be afraid to ask questions. …[don’t] be the person in the room who pretends to know everything, because that, to me, it’s really off-putting, especially when it’s pretty obvious when someone doesn’t. RRFC: Yeah, absolutely. And all of the greats, that’s what they always say though, right? They always tell you, ‘Hey, I’m always learning. It is always a process of discovery.’ Jake: Yeah, exactly, and there isn’t one answer to anything. There’s multiple ways to get at something. And to admit when you’re wrong, I mean that just goes along with what you’re saying. I’ll do that when we’re producing a session. ‘Hey, try this harmony. Try it on here.’ [And then] I’m like, ‘You know what, I don’t like it. I liked it better without it.’ And to be able to take that step back, to me, shows your clients that you’re willing to try things and you’re willing to admit mistakes, which then they’re willing to do that, too. RRFC: So are there any notable students or graduates of the program that you’d like to mention? Jake: I hate to say my favorite, but I mean, Tricia was the first student that went through the program with us here, and she’s still employed here. That was over 10 years ago. At that time her last name was Datama…Now she’s married and it’s Tricia Mindham…She’s in here a few days a week, and just an incredibly organized person, great social skills. Her word means something, when she says she’s going to do something, she does it, and [is] really, really good at that. Give her a complex task and she’s really good at figuring it out. She was one of those kind of students who really understood, ‘Hey, I want to do this one-on-one, I want to go in-depth, I’m going to ask a bunch of questions.’ And of course she’s still here, and I wish I could have more hours out of her now. RRFC: There are so few women in audio. Do you have any insights on that? How can we change things? And do you think things are changing? Jake: I’ve noticed that also, and over the years I’m like, it seems like two thirds of our clients are women, and it’s totally true. And I was like, ‘Why is that?’ Well, we’re a clean place, we’re a professional place. A lot of the other places and studios where I worked are kind of dingy rock n’ roll studios where the bathroom is untidy and all that…Maybe it’s just that I’m good at interacting with women, or we as a team are good at interacting with women. Or maybe it’s that we’re embracing that more…I don’t know what it is, but for some reason, we’ve been kind of a go-to place for a lot of female artists in town…I mean the trend is definitely shifting. RRFC: What advice would you offer to students besides what’s in the book? What should students ideally be doing, even if it’s not in the curriculum? Jake: I always tell the students when they come in [that] the best way to get a relationship with a studio is to bring in work. That’s what they want. They want you to bring in work…[Also] having gone through from the other side of a project, being the client, is a really important thing, too. Not everyone has done that, because not everyone is a musician, not everyone is in a band. So even a friend who’s doing a recording project, you could just sit in on a few of their sessions. See what it’s like, because I think people’s vision of what the job is, and what it really is, are two very different things…The other [bit of advice is] is be there to help. Understand that offering assistance, however small it is, ‘Hey, can I help load your gear in? Can I give you a hand with that? Hey, is there anything else I can do?’ I love that one, when someone says that. ‘Hey, is there anything else I can do?’ and I’m like, ‘I hate to say it, but do you mind sweeping the floor out there? It’s been a week since it’s been swept,’ and they do it…Be there to help, whether it’s with an artist or whether it’s with the studio or whether it’s with anything in life, because you learn a ton from doing that. Plus, you get a lot of people on your side. 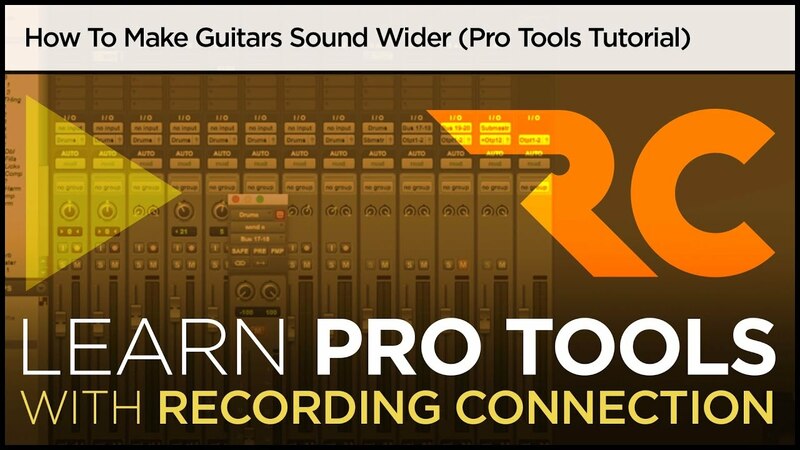 Pro Tools Tutorial: Tips on using filters & delays to plump up those guitars in a cinch!